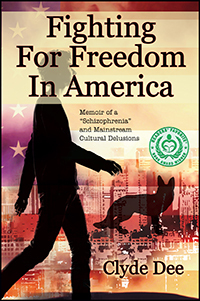 In the frontiers of America’s mental health institutions, fighting for freedom can become very personal. Six years into a clinical career, anonymous mental health worker, Clyde Dee, starts work in a Section 8 housing project that is notorious for crime. Getting to the bottom of what's going on in a fractured system, Clyde finds himself mysteriously compelled to break the codes of standard drug war conduct. After six months of uncanny threats and coincidences, he decides to go off a low dose of anti-psychotic medication. Stopped by police in an effort to exit the country, he ends up incarcerated in a State Hospital for three months and released to the streets. In the years that follow, Clyde moves through American disparities and cultural delusions, facing some of his worst fears come true. Tim Dreby is a licensed psychotherapist with over twenty years of experience who works in an inner-city mental health facility. Raised in a private school, he sought refuge in a ghetto community to hide a history of male anorexia. Working his way through, Tim has learned to champion the untold story. One day he hopes to help revolutionize treatment for "psychosis" across diagnostic divides.